In the previous post, I shared the first piece I created with the glittery seashell fossils that captured my heart. For this post, I’d like to present my new line of Deep Sea Luxe baubles! This necklace features a pendant with a nice big, 7.25 carat, oval aquamarine cabochon with two Imperial topaz drops: one heart shaped briolette, and one raw crystal drop. 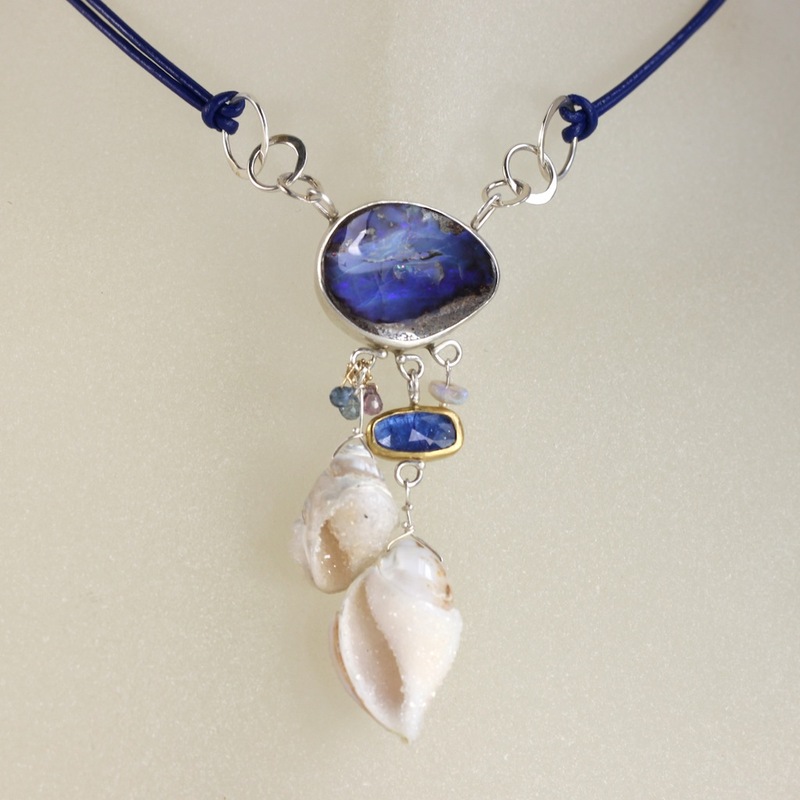 Blue and orange sapphire briolettes, an Australian opal, and of course, a seashell fossil. The pendant is attached to a strand of raw Imperial topaz, with a sterling silver chain and a toggle clasp. Maybe something mis matched to match? In addition to the seashells, this baby has shades of purple: Rose cut Ceylon sapphire, sapphire briolettes, a gorgeous boulder opal with lavender and blue/green tints, strung on a strand of Australian opals. How about something to match but not too obvious? This pendant is strung on purple/blue leather, the length is adjustable from a choker to almost 24″. This seashell is strung on natural zircon, a very cool gemstone. Unfortunately it often gets confused with cubic zirconia (which is a lab created imitation diamond). Natural zircon’s brilliance and dispersion is very similar to diamonds. You are currently viewing the archives for May, 2014 at ledajewelco.